Platinum Lamps was established in 2007 to offer the market an incredible deal on high quality OEM inside projector lamps. Before the creation of Platinum Lamps users only had the option of buying projector-branded lamps that were very expensive (and high quality), or cheap copy-lamps (with poor performance) from Asia. Often the copy-lamps had a limited warranty and could be unsafe. Platinum Lamps realised that if we could get the same housings/cages as the projector manufacturers, and combine them with high quality original OEM lamps used by the projector brands we could create a cost effective high quality product for consumers everywhere. We worked hard to create relationships with the leading manufacturers of projector bulbs including Philips, Osram, Ushio, and Phoenix; and then found the module suppliers to turn the Platinum Lamps' dream into reality. 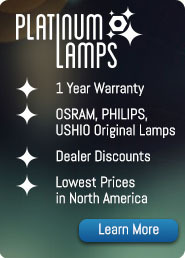 Recognizing that warranty is the ultimate testament to quality, Platinum Lamps come with an exclusive 1 Year Warranty on all lamps. We've also achieved incredible volume discounts from our OEM projector lamp partners, so now we can pass on the savings to our customers. We guarantee the lowest prices on "OEM Inside" projector lamps, and will beat any established competitors' price. Since the launch of Platinum Lamps we have gone from strength to strength and now offer over 4,000 projector lamp combinations. We cover almost 80% of the entire projector market and have a network of resellers worldwide who proudly represent and sell our Projector Lamps. Platinum Lamps are distributed worldwide by Projector Lamp Experts. 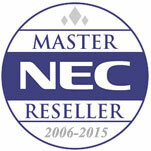 For reseller / trade discount information please email info@projectorlampexperts.com.